entry testing canine unit (OK, Hooligan jumped on me while I was counting and had to re-count!). Thanks to all our new followers and fans ~ and welcome! Stay tuned for this week's giveaway... more yarn (from Laines Magnifique). This week's planned giveaway didn't quite come together, but since I am in the process of destashing and decluttering here at home, I thought I would offer up some yarn, anyway! This giveaway is for a 3.5 oz. skein of worsted weight Cassiopeia 100% Merino superwash yarn. Hand dyed by Tia of Julibeans in her 'Saorise' colorway (green, pinks, cream and tan/ warm soft brown). I have just completed a sweater for Rowan with this yarn. It is absolutely lovely and a dream to knit! Here is one kit up picture, click HERE to see the full post and truer pictures of the colorway. And, since this giveaway doesn't include a feature, I thought I'd add some more ways to win! 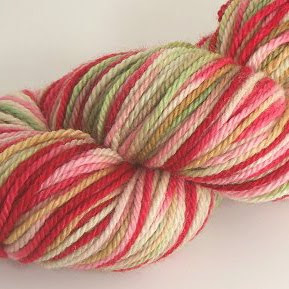 AND if this post gets over 300 comments, I will throw in the matching pink trim skein (1.5 oz. ), too! The winner will be randomly drawn from qualifying entries (comments) on Monday, January 24 at 10 PM est. I love the colors in this yarn. Beautiful. I "Like" Beneath the Rowan Tree on Facebook. I emailed my daughter about this great giveaway. Hi. Great giveaway! I am a fan on Facebook and follow this blog. Thanks so much for doing this! Oh I love Tia's colorways! I just commented on your Wordle post below. Thanks! This is very pretty yarn. I follow your blog. Gorgeous yarn! I can't wait to see Rowan's sweater. Linked to giveaway on FB.. I am also know a follower of your blog! I'm a fb fan, pietrastodo(at)gmail.com! I "like" you on Facebook and I follow your blog. Thanks for doing this giveaway! It's beautiful yarn. entry #2: I'm following your blog! that is some awesome looking yarn! i emailed tami lewis about it! So pretty! Thanks for the generous giveaway! Ooooh what lovely yarn. I am GetKnitted on Rav. I like you on FB. GetKnitted on rav. Beautiful colors!!! My contact info is in my profile. I am a avid follower! I'm a fan on Facebook (under my real name). I shared this giveaway on Facebook (again, under my real name)! i commented on The "Dragon's Tail :: Silk & Life post"
Ooh, this yarn is lovely, thanks for a great giveaway! What beautiful yarn! Thanks for sharing! Lovely yarn! I'd knit a baby sweater with it. I commented on your wordle post. January 24th is my birthday. Hope I will win this! Beautiful yarn, I found you from Ravelry Thanks for the giveaway. And....I like your blog on facebook! 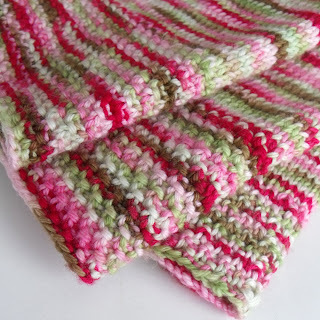 MamaMay on Ravelry! I follow you! I hope I win, lovely blog! What a beautiful color combination. Love it! Also, just started following this blog. What lovely yarn - thanks for having a giveaway! I love the colors in this yarn. It makes me think of strawberries and cream. goodness gracious that is GORGEOUS. whoever wins will be so happy - if it is me, i'll be over the moon, because i can make something for my sweet little girl (we just found out she's a she!) due in june. thank you for the chance to win. i am a fan of btrt on facebook! i just commented on the 'what your words say' post. Those colors make me happy. I just started learning to knit today, for the 3rd time. It actually seems to be working this time, Yeah! I think the greens perfectly balances the peaches and pinks! Oh lovely ^_^ I'll look forward to seeing the sweater! These colours remind me of berry picking! Perfect colors for the spring season! Nice Giveaway! I would like to be entered! I blogged about you and the giveaway here. I left a comment on this post. So inspiring! I e-mailed my sister about this. She'll love the whole blog! Beautiful yarn, thanks so much. I follow via GFC. My son would love this yarn. It looks really nice. What beautiful yarn and what a generous giveaway! I'd love to enter! I'm a BTRT fan on Facebook. "Liked" y'all on FB. I do love your toys! I can always use more yarn! how I would like that yarn. SOCKS??? I'd love to knit something from this yarn! that is also the contact for my previous post. 1. become a follower of the blog ... I have now become a follower of your blog! and linked it to my google reader so I won't miss a post! Thanks. Lovely choice of giveaway yarn! Love the colors. I also follow your blog, using Feedblitz. I emailed my daughter about this giveaway. 7. share the link on my facebook page. I have shared this link! I really love the color of this yarn! 5. I commented on your "off the needle" post. Love that sweater and the look on her face is priceless! Normally not my kind of colors but I love it! I love these colours! Thank you for doing this.